Hi friends! Among the many great things about attending a writing workshop retreat is you are turned on to some new work. 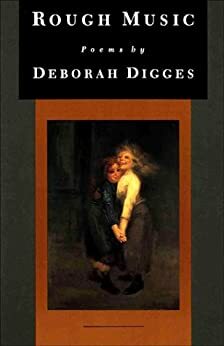 And so, yesterday I received Rough Music by Deborah Digges, a poet we discussed on Tuesday morning at Esalen. I can still hear Dorianne Laux’s mesmerizing reading of Deborah’s poem, “Broom,” which opens this astounding collection. And the haunting story of the poet’s life, and tragic death. And so, at the top spot in this week’s HUMP day posts, comes from a fellow poet and workshop participant, Jeanie, who sent me the link to another great article about Deborah Digges. Enjoy! When you think you have all the answers, ask more questions. They all begin with self-inquiry. Talk a walk in nature. Listen to the breeze. Or the bees. Or just be. This entry was posted in Hump Day Hangouts, Uncategorized on August 14, 2013 by Robert Vaughan. Hey, Robert, great post and thanks so much for the quartet mention (Counterexample/Tantra Bensko/Matthew Dexter/Erie Chang). Really nice of you! I love the idea of a “Top Spot” (with graphic) in your “HUMP DAY” reflect post. It gives us something to shoot for, and it sort of reinforces the idea that you’re compiling and curating, indeed REFLECTing. Awesome work, and I’m glad you enjoyed your retreat! James, thanks for reading and commenting! Keep doing the great things you are achieving at CEP and more! Thank you so much, Robert, for sharing the Deborah Digges article. I was so touched by all of it and her work is just powerfully enchanting. in the end she found someone who really cherished and ‘got’ her. Dear Mary, thanks so much for your lovely comments. As a newer reader to Deborah Digges, I was also really moved by the Tufts article and the first book of poems (her third) to come to me…Rough Music. I simply can’t put it down! I LOVE IT! How interesting to hear that she settled in Worcester, MA. Indeed, we do have small circles in our lives, don’t we? So happy you found your way into mine. Thanks, once more, for the mention.